R2i Millwork Chair Rail - Prefinished Ready to Install - Fauxwood White - 5/8 In. x 13/16 In. x 8 Ft.
Alexandria Moulding Finger Jointed Pine Trim 5/16 In. x 1-1/16 In. x 7 Ft.
Ornamental Mouldings OML52-8FTPOPR chair rail moulding is an elegant accent to any room. The moulding is affixed horizontally on the wall 3060 inches from the floor to provide protection against chair backs. Pair with decorative trim to create stunning wall panel effects. Timeless elegance. Add character and charm to your room with this traditional egg & dart pattern moulding. This moulding is the perfect decorative accent to your room, furniture or craft project. You are limited only by your imagination. Add character and distinction to any space with this beautifully designed dentil moulding. 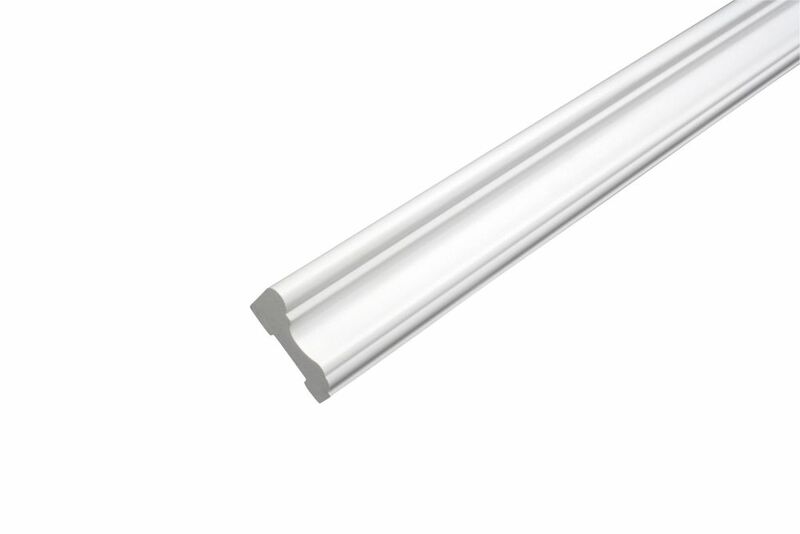 This trim moulding has a variety of application uses that can transcend the ordinary to jump into the realm of finer detailing. This moulding is the perfect decorative accent to your room, furniture or craft project. You are limited only by your imagination. Chair Rail - Prefinished Ready to Install - Fauxwood White - 5/8 In. x 13/16 In. x 8 Ft. Imagine transforming your room without painting! R2i "Ready 2 install" moulding technology gives you a durable professional finish is a time saver and It won't mark and dent like MDF Fiberboard. Bring your room to life! Remodel in hours and instantly enjoy with our pre-finished and ready to Install mouldings. Chair Rail - Prefinished Ready to Install - Fauxwood White - 5/8 In. x 13/16 In. x 8 Ft. is rated 5.0 out of 5 by 1. Rated 5 out of 5 by 49andholding from Easy to work with It's made from a high density plastic with a durable and deep finish. It cuts cleanly with a saw and router.